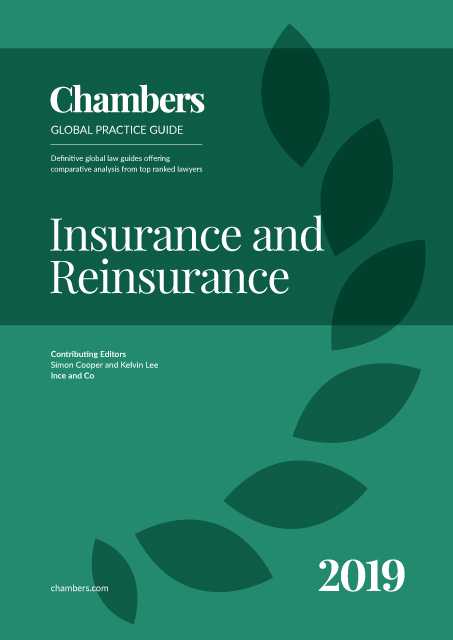 The Insurance and Reinsurance 2019 guide provides expert legal commentary on key issues for businesses. The guide covers the important developments in the most significant jurisdictions. Ince Gordon Dadds Ince Gordon Dadds are an international commercial law firm that serves its global client base from offices across Asia, Europe and the Middle East. The firm provide high-quality legal advice and strategic guidance to clients based in four core sectors: transport, trade, energy and infrastructure and insurance. By combining its sector expertise, legal knowledge and market experience, Ince Gordon Dadds deliver services in support of its clients’ most complex disputes, transactions and projects. With over 500 people, including over 90 partners and more than 190 other lawyers worldwide, the firm practise English, French, German, Greek, Hong Kong and PRC law. Singapore law advice is provided by Incisive Law LLC, with whom Ince Gordon Dadds have a Formal Law Alliance. In jurisdictions where the firm does not have an office, it work with law firms with whom it has established strong relationships. In 2018 the drive to modernise the world’s insurance markets has continued apace and that trend will continue in 2019. The changes being introduced are in many cases fundamental and bring with them a range of legal and regulatory challenges for insurers, brokers and regulators alike. One aspect of the drive for modernisation is the continuing search by the established insurers for new markets and territories in which to expand. This reflects the continuing over-capacity in traditional markets which increasingly has led to market saturation. The desire for expansion is being assisted by regulatory adjustments in some jurisdictions which are increasingly open to external investment, but it is also challenged by the growing assertiveness of insurers domiciled in emerging markets. It is imperative, therefore, that insurers, related professions and their advisers all understand the different legal and regulatory requirements for operating in different jurisdictions. This Guide, written by experts from around the world, seeks to provide a practical overview of these requirements in the key international jurisdictions. The growth of InsurTech and the wider use of artificial intelligence continues to present both opportunities and challenges to insurers and brokers. This topic is discussed more fully in section 10. In essence, however, insurers are using InsurTech to create more personalised and better targeted insurance products, through the development of sophisticated algorisms to analyse detailed source data and broader market data to produce a highly specific risk profile and price. Similar initiatives are being developed to speed up the handling of claims while increasing insurers’ ability to detect fraud and analyse the cost and benefit of claims disputes. At present, these advances are limited principally to personal lines of insurance and SME business; it is expected, however, that they will be applied to larger commercial risks in the coming years. The increasing use of InsurTech and AI more generally brings with it significant legal and regulatory challenges and the responses are likely to vary from jurisdiction to jurisdiction. For example, InsurTech involves managing huge quantities of personal data which is often of a sensitive nature. The coming into effect of European Union’s General Data Protection Regulation (“GDPR”) has created a new legal regime within which insurers have to manage this data and very significant financial penalties for non-compliance. Importantly, although this is an EU Regulation, it applies to insurers anywhere in the World who hold information about EU citizens. Potentially, therefore, it has ramifications for insurers and their advisers wherever they may be. One of the key objectives of InsurTech is to strengthen the connectivity between insurers and their clients. This is achieved through more personalised underwriting and the adoption of different distribution methods, including social media and internet apps. Many innovative, new products rely on source data gathered through wearable technology and the internet of things. These communications, and information from such things as wearable technology, will be subject to a new EU initiative which is set to come into effect in the second half of 2019. This is the e Privacy Regulation or ePR. As with GDPR, ePR will have a worldwide reach and bring with it the same significant penalties for breach as GDPR. As well as the regulatory issues associated with the growth of InsurTech, the adoption of AI technology by insurance buyers raises new legal challenges for insurers. Among these is the question of where liability will lie if a piece of AI technology dependent on machine-learning causes injury or breaks the law. Similar issues will arise in relation to the programming of autonomous ships and vehicles and the choices which they may have to make when faced with the likelihood of collision. The answer to these questions is likely to differ between jurisdictions so it will be important for insurers to understand local laws before accepting business which exposes them to risks of this nature. 2019 is likely to see a continuing increase in political tensions between some of the world’s leading economies and the insurance industry is not immune to the commercial consequences of this conflict. For example, the imposition of sanctions by the US and its allies, and the retaliatory sanctions from the targeted countries, is creating a difficult legal and regulatory environment for Insurers. These difficulties are only enhanced by conflicts between differing sanctions regimes. For example, European insurers find themselves trapped between renewed US sanctions against Iran and the EU’s Blocking Regulation which is intended to limit the impact of those sanctions on EU-domiciled insurers. Balancing these conflicting regimes raises legal barriers for insurers, both in the settlement of claims and in the collection of premium from risks which impact the sanctions' jurisdictions. The deterioration in trading relations between the world’s two largest economies, the US and China, is not currently impacting insurers directly at present but it is by no means clear that that position will be maintained if the conflict escalates in 2019. On a more positive note, however, 2018 has seen the relaxation of regulations which has limited the ability of insurers to trade in some jurisdictions and this trend is set to increase in 2019. In particular, China’s One Belt One Road initiative has dramatically increased the ability of insurers, brokers and related industries to invest and trade in China. New regulations introduced in 2018 allow foreign investors to take controlling stakes in joint ventures, set up wholly foreign enterprises and to have the same business scope as fully Chinese-funded companies. Insurers will be hoping that this regulatory relaxation will be reflected in other jurisdictions. Similarly, regulatory restrictions on European reinsurers doing business in the USA are to be relaxed in 2019 with a complementary relaxation of European regulation for US companies. This new regime is set out in the awkwardly titled Bilateral Agreement between the United States of America and the European Union on Prudential Measures Regarding Insurance and Reinsurance, which is more commonly known as the Covered Agreement. The Agreement, which will reduce and ultimately eliminate the collateral which European insurers have to post to write US reinsurance business, was approved by the Council of the EU on 6 April 2018 and will be phased in over the next five years. Consideration is being given to extending the Covered Agreement to cover non-EU countries. British insurers will not benefit from the Covered Agreement when Brexit takes effect. This is one of the many regulatory and legal uncertainties which will continue to hinder European insurers through 2019. Until the post-Brexit regulatory framework for insurers has been agreed, there will inevitably be uncertainty over the ability of UK insurers to write European business (and vice versa) and how that business may be written – for example with respect to the regulation of underwriting agents. 2017 saw very substantial losses in the insurance industry with Lloyd’s of London recording its first loss for six years. These losses were principally the consequence of natural catastrophes including hurricanes in the US, earthquake in Mexico and flooding in South Asia. Although 2018 looks likely to be more benign in terms of insured losses, there is a general concern that climate change will see a long-term increase in the number and severity of catastrophic losses and we can expect to see continuing lobbying by the insurance industry for law reform and regulatory change in this area. At the same time, new risks are emerging and concern continues about the potential for a ‘new asbestos’ - be that legalised cannabis and medical marijuana, opioids or microplastics and nanotechnology. The legal context for the handling of insurance claims and coverage disputes will in different jurisdictions play a large part in determining the impact of any of these risks which do emerge. Notwithstanding the uncertainty and risk development which the industry faces over the coming years, there is no shortage of investment, with private equity houses continuing to show an interest in the industry. 2018 had seen the continuing high level of M&A activity among insurers and brokers, with many small brokers that broke away following the financial crisis being reabsorbed into larger organisations, and that trend seems likely to continue into 2019. In addition, money from outside the industry continues to be invested in new insurance vehicles such as Insurance Linked Securities with the first ILS products underwritten under the British Government’s new ILS regime. It remains to be seen, however, whether the regulators in the UK and elsewhere can be sufficiently flexible to wrest a meaningful share of this market from Bermuda. Overall, 2019 will see the continuation and speeding-up of the modernisation process across the insurance industry together with the slower, but nonetheless significant shift towards new markets and new ways of doing business.